Et pour prouver que vous n'êtes pas un robot : 3 plus 6 = ? Tereska Szwarc épouse Torres Levin - son Livre d'or ! Mon nom est Jacques Drabier je suis né en 1922, je suis un survivant du Trébouliste je suis français et joint le General de Gaulle en 1940.C'est moi qui a créé l'insigne des forces françaises libres. je suis un ancien de l'école des Beaux Arts de Paris. J'étais pilote de chasse des FAFL, sur le P-47 Le Thunderbolt. Je viens de terminer mes mémoires en anglais et je suis actuellemnt en train de le rédiger en Français. J'ai reçu le 18 juin 2010 des main du président Nicholas Sarkozy ma médaille de la Légion d'honneur. Through the steamed-up windows of a black cab, beaded with heavy raindrops, a white-haired old lady peers out on to London. Impatiently, she wipes the glass with her sleeve and shakes her head, perplexed. "I don't recognise anything," she mutters and sits back on her seat, indignant at having been deceived by the slipperiness of memory. 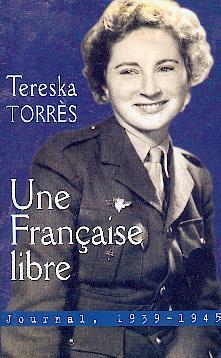 Tereska Torres is a French writer who worked with General de Gaulle's Free French forces in London during World War II. I have joined her on a nostalgic visit to the settings of her 1951 novel, Women's Barracks, which broke taboos by telling of unmarried mothers and lesbian affairs. We drive on in silence. And then, quite suddenly, she lurches forward and shouts to the driver, "Here! Turn here for Hill Street!" I knew she would remember. It may be almost 70 years since she first arrived at this Mayfair address but her recollection of the years she spent as a soldier in Charles de Gaulle's Free French forces is still acute. As I had listened to her telling me stories back in her Paris atelier, the browning photos of uniformed girls in her scrapbooks had ceased to be still images and instead had seemed to dance with the sounds and smells of life in the Gallic Women's Barracks. She told tales of camaraderie, of women from all walks of life thrown together in an alien country, tales of lonely Christmases singing French carols and desperately trying not to think of home. There were apocalyptic accounts too of watching London burn, of courage in the Blitz and proud memories of moments on the number nine bus when a Londoner would notice her French uniform and lean over to say: "Vive La France!" Despite the incessant rain, Tereska is anxious to get out of the taxi. Armed with an umbrella and laughing that it rained here incessantly throughout the war, she stands on tiptoe and squints through the windows of the big house which was once her old barracks, beaming. I think back to my favourite photograph of her in her frayed albums. It was snapped on the day she first reported to Hill Street, a pretty young girl caught in mid-step, kit bag slung over her shoulder and cheekily smiling sideways at the camera, her eyes sparkling with an infectious excitement. I had asked her then what possessed a cosseted, convent-educated 19-year-old to leave everything she knew to come to Britain. She had spoken bitterly of the shame she had felt when the Vichy government capitulated to the Nazis in July 1940. The minute she had heard that a French general was continuing the Resistance in London, she had packed her case immediately and begun the long journey through Spain and Portugal to Liverpool. It was, she told me, the obvious thing to do. Every place we pass is now triggering vivid memories. As we drive down Pall Mall, she giggles about the day she was riding her bicycle here and two "sweet little girls" wound down the window of their expensive car to get a good look at this strange French woman cycling in central London. As she waved back, she realised those two sweet children were Princess Elizabeth and Princess Margaret. In the distance are Westminster and 10 Downing Street, where once she and her fiance Georges (the son of the exiled French prime minister) went to beg the Churchills to put pressure on his father to allow them to marry. I wonder, when she falls silent, if her mind is being flooded by heavier recollections too. I ask myself is she is remembering the aching homesickness of exile or the moment when, five months pregnant, she was told her husband Georges had been killed, back in France, and would never come home to her again. In Trafalgar Square we meet Claire, Tereska's great confidante during the war and one of the only other surviving members of the barracks. In Carlton Gardens, where de Gaulle's headquarters had been, the two old ladies stare at the faded plaque on the wall and stand before his statue. 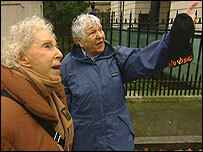 "Look at us," Tereska laughs. "How strange that we should be here, two old soldiers loyally returned to their posts though their general's long dead and gone." Later, at lunch in Fortnum and Mason, I see a young French waitress shyly ask Tereska what they are doing here, their table scattered with black and white photographs. When she is told their history, the waitress immediately thanks them for everything they have done for France. Leafing through the pictures myself, I ask Tereska whether - when she looks at herself now and when she looks at Claire - she still sees those two youthful French teenagers who all those years ago proudly signed up to join de Gaulle's army. Tereska carefully takes in Claire's soft wrinkles and white hair and glances at the few liver spots on her own thin hands. 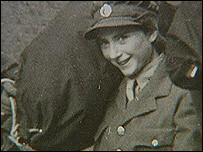 "I remember a girl called Claire and I remember a girl called Tereska," she says slowly. "But they were two girls from a long time ago. They're no longer us." I sit on a bar stool and watch the pair of them giggling together in French, conspiratorial, delighting in the absurdity of eating English oysters in a restaurant that 70 years ago had been way beyond the reach of an army pay packet. As Tereska looks up, I see in a flash - only slightly refracted - the pretty young girl in the browning photograph, kit bag slung over her shoulder, determined to fight for France's freedom.